One feature which I find awesome in ASP.NET 5/vNext is the ability to download MS source code and debug it locally (I discussed this here under the global.json section). This was discussed in several sessions with Scott Hanselman and demonstrated well with Damian Edwards (Deep Dive into ASP.NET 5 – approx minute 16:20 into the session). I find this feature great because there have been countless times that I tried to understand why .NET was behaving the way it does. Despite .NET source code being available for download and debug sometimes, it was hectic getting it to work and eventually I used reflection tools to read .NET assemblies and trying to understand why things are working (or not). So being able to simply download the code and using it locally sounds great. However despite the session with Damien I still had problems getting it to work and Damian was kind enough to assist me where I had trouble. I assume that MS will make it easier in the future. On stage Scott and Damian discussed having a context menu option to “switch to source code”. Indeed it could be great, especially if that will also download the correct version of the source code – because that is mainly what was giving me trouble. 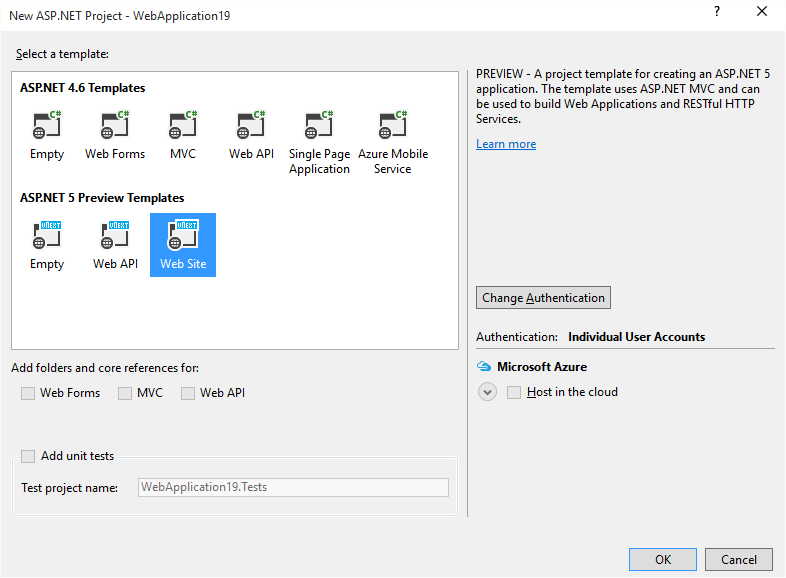 Create an ASP.NET 5 app using the template website. Run it (F5), just in case to see that it works and that if you encounter errors in the process, they are not related to something else which is faulty. 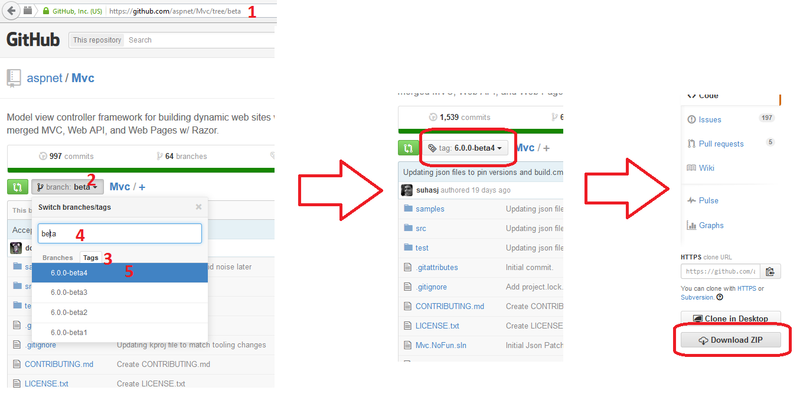 Once downloaded and extracted, edit global.json in your solution and add the local path to the “projects” element. Note that the slashes have to be forward slashes. As soon as you click save you will witness the Solution Explorer going berserk as VS automatically loads the local source code. More importantly, you can see that the icon in VS for MVC has changed to that of local files. Basically that’s it. You can now re-run the code and step through. Taking Damian’s example from Build 2015, I inserted the new <cache> tag and placed a breakpoint within the CacheTagHelper class. This is a followup to the previous post discussing my first steps with vNext. I suggest reading it first. 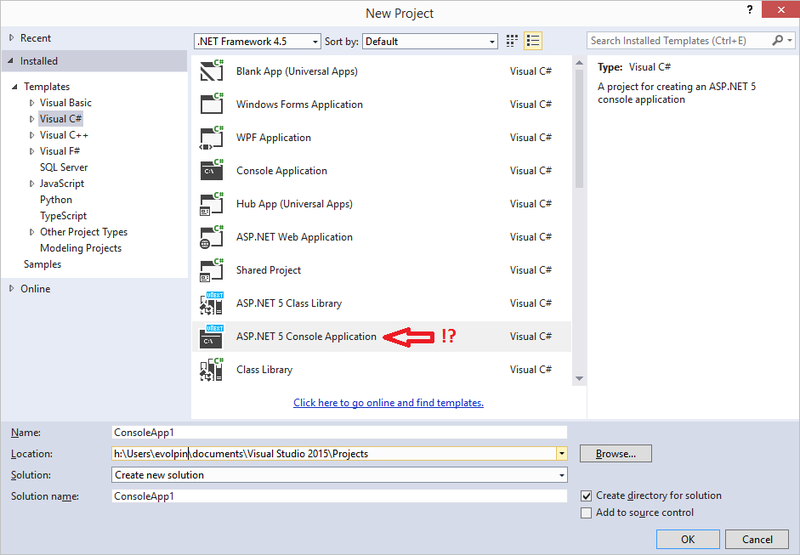 vNext class libraries are similar in concept to a regular .NET library. Like ASP.NET vNext they do not actually build to a dll. What is great about them is that you can basically change the vNext library using notepad and it will be compiled on-the-fly when you re-run the page. However unfortunately code changes done in vNext, including vNext libraries, will require a restart of the host process in order to take effect. It would have been great if code changes did not require this restart and the state of the app would be maintained. The good news is that you can reference regular .NET class libraries from vNext. This may sound trivial, but up until the recent beta 2 and VS2015 CTP 5 it wasn’t possible unless you pulled a github update and manually “k wrapped” your .NET assembly with a vNext library as explained here. Fortunately CTP 5 allows referencing a regular .NET library but it is still buggy as VS might raise build errors (as it does on my machine), but the reference will actually work and running code from a vNext MVC site actually invokes the compiled .NET dll. 1. I create and open a new ASP.NET vNext web application. This time I’m using an Empty project and adding the bear minimum of code required to run an MVC app. project.json: Add a dependency to “Microsoft.AspNet.Mvc”. Running the code now “as is” should show a “hello” string in the web browser. 2. I am adding a vNext class library (this isn’t mandatory for running a .NET lib but I do it anyway for the sake of the demo). At this point I recommend to “Start without debugging” (Ctrl F5). If you don’t do that, any code changes will stop IISExpress and you’ll have to F5 again from VS. You can do that but it will not be easy to take advantage of the “on the fly” compilation. Note the process ID in iisexpress. 2508. 3. Now create a new Class Library, but this time not a vNext library but a regular .NET library. Error CS0103 The name ‘ClassLibrary2’ does not exist in the current context. Changing the regular .NET code and saving has no effect as expected, until you recompile it. 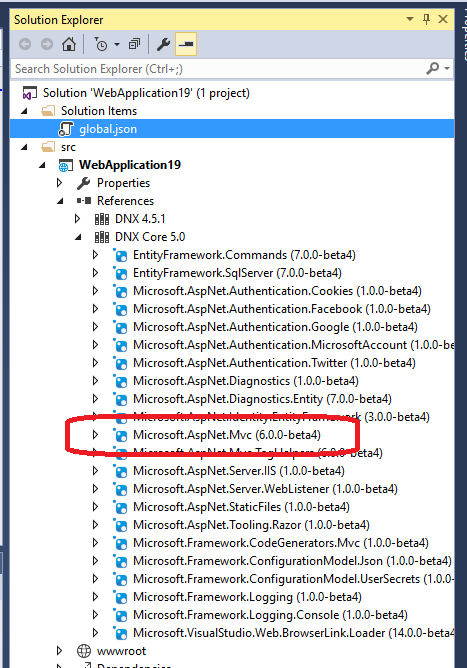 Migrating a .NET web app to vNext. You may want to use vNext for the ASP.NET tier and use your older business logic and data layers regular .NET assemblies until you decide to migrate them. Security: If you deploy a vNext app which is not precompiled, a hacker might change your code and vNext will compile on-the-fly. You may claim that you should not deploy non-precompiled apps, but I think differently. I see it as a great advantage to be able to make changes on a server using notepad, in order to perform a quick fix or debug an issue. The downside is the potential hacking. Not sure if MS will allow a single vNext class lib to be precompiled while the rest of the site to be deployed with its source code. If not, perhaps the solution is to use a pre-compiled regular .NET class library for sensitive code, deployed with a non-precompiled vNext app. Referencing a 3rd party .NET library which does not have a vNext package might be useful. I assume that Microsoft will spend more time making this wrapping mechanism transparent and flawless. Basically I see no reason why adding the dependency to the wrapping vNext lib isn’t a part of adding a reference to a .NET lib. A good reference to vNext Class Libraries can be found in the video session of Scott Hanselman and David Fowler: http://channel9.msdn.com/Events/TechEd/NorthAmerica/2014/DEV-B411. This is a big topic. I have had trouble writing about this because it is so big. So I decided to split it into several blog posts. This first post is divided into several parts: intro, cool features, getting started and the K* world. Disclaimer: Many of the stuff written here is based on beta1 and then beta2 which was released as I was into writing. Lots of stuff is bound to change including the names of the various stuff that can be seen here. An intro (level 200) by Daniel Roth: http://channel9.msdn.com/Events/TechEd/NewZealand/2014/DEV213. Another good introduction (level 300) although slightly older by Scott Hunter and Scott Hanselman:http://channel9.msdn.com/Events/TechEd/NorthAmerica/2014/DEV-B385. A continuation session which is a more “in depth level 400” by David Fowler and Scott Hanselman:http://channel9.msdn.com/Events/TechEd/NorthAmerica/2014/DEV-B411. Rick Strahl published a very long article summarizing the vNext conceptual changes: http://www.codemag.com/Article/1501061. Repository and getting started vNext on github: https://github.com/aspnet/Home. The ability to run ASP.NET over Linux or Mac is a long awaited revolution (did someone just shout Mono?). Time and again I encountered customers who were opposed to use Windows based servers just because they are Microsoft’s. The option to develop .NET on a Windows machine and run it over a non-Windows server is something I really look forward to. For Windows based servers, IIS is supported but not required. Your app can also self host itself. Yes, I am well aware of the Mono project and that it exists for years. But it makes a world of a difference to have Microsoft officially support this capability. Up until now this feature was available only to Web Site development (File->New->Web Site). In a Web Application (File->New->Project->Web) you can change a cshtml/aspx file, refresh the browser and watch the changes. But in Web Site you can also change the “code behind” files (e.g. aspx.cs), handlers, App_Code, resx files, web services, global.asax and basically everything which isn’t a compiled DLL. This allowed you to make changes on a deployed environment. This is a very important ability as it allows you to change the code using your preferred Notepad app without requiring Visual Studio and a compiler. Why is this important? Here are several examples: a) you can insert debug messages to understand a weird behavior on a production server; b) potentially fix errors on the spot without having to redeploy the entire app or a hotfix; or c) simply change a resource file. Time and again I used this ability on different servers for various purposes. In fact, to me this cool “on the fly” compilation was probably the most significant capability that made me time and again choose Web Site over Web Application. But that also means Web Forms over MVC. On a side note, to be honest, up until now I am not convinced that MVC is a better paradigm than Web Forms. I also prefer Web Forms because of the great PageMethods/WebMethods js client proxies. Unfortunately it is clear that Web Forms will become more and more obsolete as Microsoft pushes MVC. vNext works with MVC. Not with Web Forms. Web Forms continues to be supported for now but it will not enjoy the vNext features. But I was very thrilled to hear and see that vNext allows on the fly compilation too. Not only can you change Controllers and Models and run your software, but you can also change vNext Class Libraries and change them using your favorite Nodepad – and that – is something that you cannot do in a Web Site – you cannot change a compiled DLL using notepad! This is a very cool feature indeed, although it does made you wonder how you are supposed to protect your deployed code from hackers who may want to change your license mechanism or bypass your security. When I asked Scott Hunter about this, he replied that there is a pre-compilation module and that it will be possible to precompile the entire site. I’m not sure that it means that you can pre-compile a single assembly. Perhaps the way to over come this will be to reference a regular class library from vNext (it is doable – you can “wrap” an regular assembly as a vNext assembly and use it from a vNext app (I will demonstrate this in the next blog post). However there is currently a difference in the on-the-fly compilation in favor of Web Site over vNext: In vNext, every change to the code (excluding cshtml) – will trigger a reset of the host. For example changing Controller code while running in IIS Express will not only restart the App Domain but will actually terminate the process and recreate a different one. This means losing any state your application may have had (statics, caching, session etc). With Web Site you can change quite a few files without losing your state (App_Code or resx files will restart the App Domain, but almost any other file change such as ashx/asmx that have no code behind or aspx.cs/ascx.cs – will work great). So making changes during development will not lose your state, or making changes on a production server – does not necessarily mean that all your users get kicked out or lose their session state. The current behavior in vNext is different and limited. I emailed this to Scott Hunter and he replied that if they do decide to support this, it’ll be most likely post RTM. I sure hope that this will be on their TODO list. There are several other features which are also important. Using vNext you can have side-by-side .NET runtimes. Imagine the following scenario: you code an application using vNext and deploy it. Several months afterwards you develop another app using vNext “version 2”. You need to run both apps on the same server. Today you cannot do that because the developed apps all use the .NET installed on the same machine. 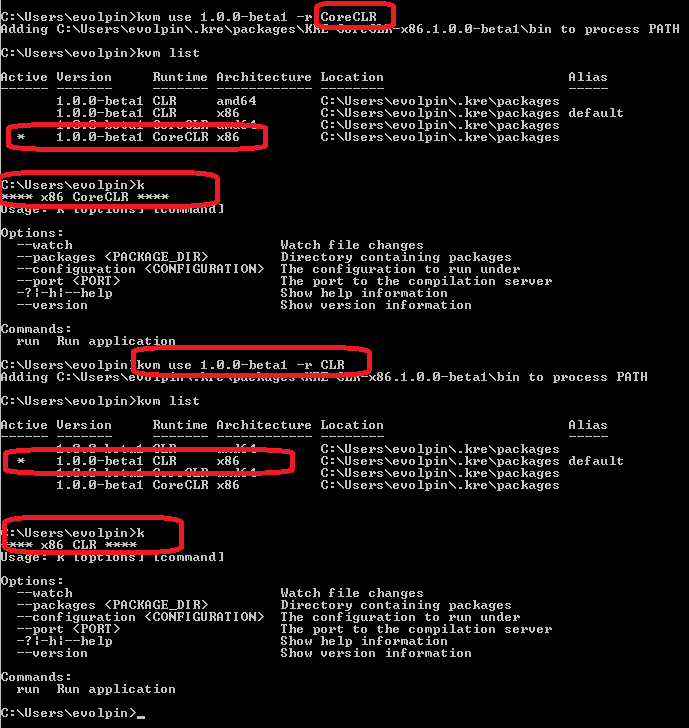 An app developed to run using .NET 4 might break if you install .NET 4.5 on the same server to support a different app. With vNext you should be able to deploy your app with the .NET runtime assemblies that it was designated to be used with. More over, vNext supports a “core set” of .NET dlls for the server. So not only you do not have to install irrelevant Windows Updates (e.g. hotfixes for WPF), but the size of the deployed dlls is greatly reduced and makes it feasible to be deployed with your app. 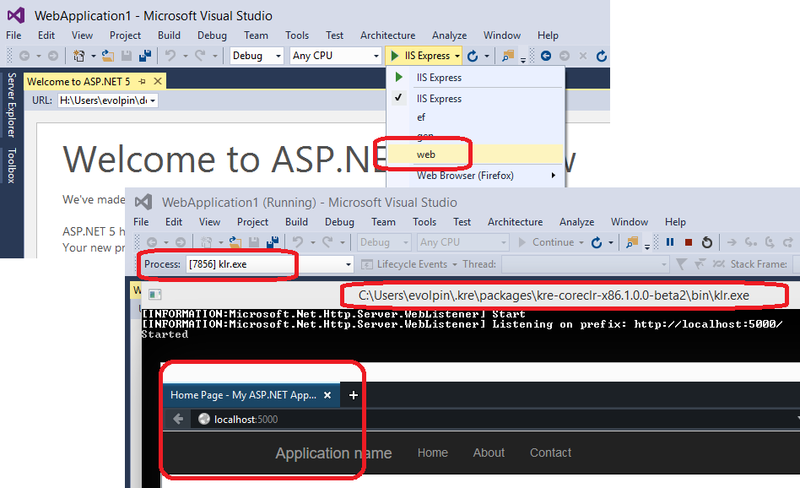 One more feature I find interesting the the ASP.NET Console Application. What!? ASP.NET Console Application!? Basically this means writing a Console application which has no exe. No build. The same vNext mechanism, compiling on-the-fly your vNext MVC app will be the one compiling and running your Console app. Eventually when released, perhaps vNext will not be categorized as an ASP.NET only component. vNext (or however it will be eventually named) will probably be categorized as a “new .NET platform”, capable of running MVC, Console app or whatever Microsoft is planning to release based on the on-the-fly-no-build platform. Although I did not try it, I assume that you can run a vNext Console app on a Linux or Mac (disclaimer: I haven’t yet tried running vNext on a non-Windows platform). Download and install VS 2015 Preview build (http://www.visualstudio.com/en-us/downloads/visual-studio-2015-downloads-vs.aspx). 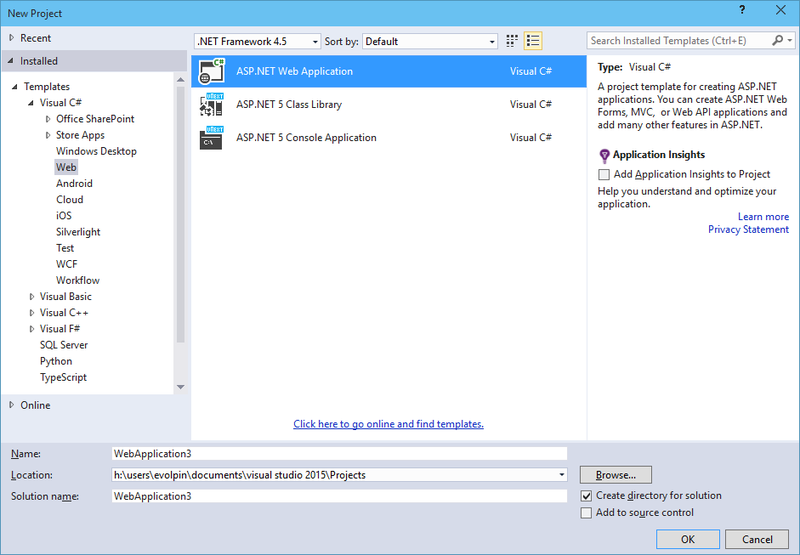 Create a new vNext Web Application using File->New->Project->Web->ASP.NET Web Application. Select ASP.NET 5 Started Web with the vNext icon. After the starter project opens, notice the “run” menu (F5). It should point to IIS Express by default. Run using F5. global.json: this is a solution level config file. Currently it holds references to source and test folders. I assume further solution and global projects related configuration will be placed in this file. A usage of this would be if you would like to specify external source files and packages. Taking Scott Hanselman’s example: you can download MVC source in order to fix a bug point to it locally instead of using the official release – at least until Microsoft fixes it. Personally I see myself using it to debug and step through .NET code. I have had more than enough situations struggling to understand under the hood behavior by disassembling .NET dlls and trying to figure out what I was doing wrong. As somehow the ability to download the .NET released PDBs never worked well for me, downloading the actual source code and debugging it locally seems useful. Another usage of this file is for wrapped .NET class libraries (beta2 CTP5) which I will describe in the next blog post. project.json: this somewhat resembles the web.config. It contains “different kinds” of configurations, commands, dependencies etc. Dependencies are basically “packages”: NuGet packages or your very own custom vNext class libraries. Startup.cs. This is the entry point in vNext. If you place breakpoints in the different methods in this file you will see that when the website starts this is indeed the starting point. Taking a look at the code in Startup.cs of the starter project you may notice that there are many things that we are used to receive for granted such as identity authentication, static files and MVC itself. In vNext we are supposed to “opt in” to the services we want, giving us full control of the http pipeline. // Add static files to the request pipeline. // Add cookie-based authentication to the request pipeline. A quick demonstration of this capability is to change the “run” menu from the default IIS Express to “web” (in the starter project) and then running the web site (this is available in the latest update of the VS2015 preview – CTP5). Notice that the running process is shown within a console window. It is the klr.exe and it is located within C:\Users\evolpin\.kre\packages\KRE-CLR-x86.1.0.0-beta2\bin. To understand what happened here we need to further understand how vNext works and clarify the meaning of KRE, KVM and K.
As previously mentioned the vNext world will have the capability to run side-by-side. It is also an open source, so you can download it and make changes. It means that development will change from what we are used to. Today when you start development you know that you’re usually bound to a specific version of the framework that is installed on your dev machine (e.g. .NET 4.5.1). In the vNext world you may have multiple .NET runtimes for different projects running on the same machine. Development could become an experience which allows you to develop alongside the latest .NET builds. Microsoft is moving away from today’s situation that you have to wait for the next .NET update to get the latest bug fixes or features, to a situation that you can download in-development code bits or the latest features without having to wait for an official release. Getting back to the version of the framework, the KRE (K Runtime Environment) basically is a “container” of the .NET packages and assemblies of the runtime. It is the actual .NET CLR and packages that you will be running your code with (and again, you can target different versions of the KRE on the same server or dev machine). Now that we have a more or less understanding of what is the KRE and that you may have different KRE versions, it is time to get acquainted with a command line utility called KVM (K Version Manager). This command line utility is supposed to assist in setting up and configuring the KRE runtime that you will use. It is used to setup multiple KRE runtimes, switch between them etc. Currently in the beta stages you need to download the KVM manually but I assume that it’ll be deployed with a future VS release. To download and install go to: https://github.com/aspnet/home#install-the-k-version-manager-kvm. 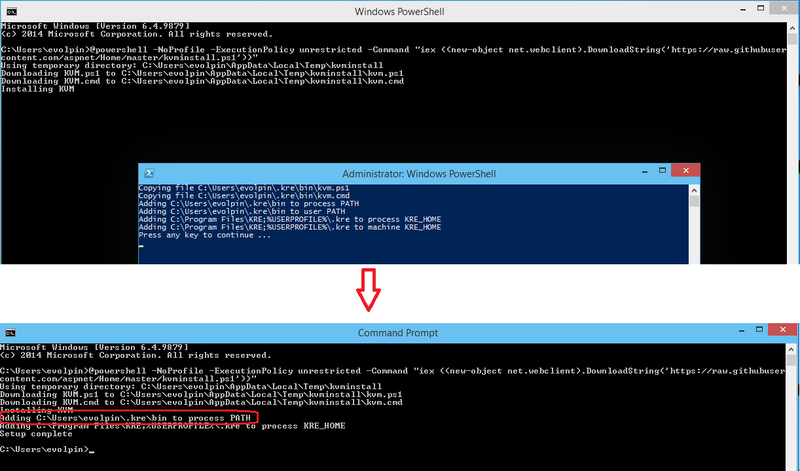 There is a Windows powershell command line to install. Just copy-paste it to a cmd window and within a short time KVM will be available for you to use. If you open the highlighted folder you will see the KVM scripts. From now on you should be able to use the KVM from every directory as it is in the PATH. If you go to the parent folder you can see aliases (KREs may have aliases) and packages, which actually contain different KRE versions you have locally. If you open <your profile>\.kre\packages\KRE-CoreCLR-x86.1.0.0-beta1\KRE-CoreCLR-x86.1.0.0-beta1\bin (will be different if you have a different beta installed), you will actually see all the .NET stuff of the Cloud Optimized version. That 13MB is the .NET used to run your cloud optimized server code (see Scott Hunter and Scott Hanselman’s video). After upgrading the x86 CLR and CoreCLR I found two new folders: C:\Users\evolpin\.kre\packages\KRE-CLR-x86.1.0.0-beta2 and C:\Users\evolpin\.kre\packages\KRE-CoreCLR-x86.1.0.0-beta2 as expected. So now we know what happened in VS when we switched to “web” in the “run” menu earlier: VS was actually running the KRE using the “web” command similar to typing ‘k web’ from the command line. KRE is the current .NET runtime being used. KVM is the utility which manages the KREs for my account, allowing me to upgrade or switch between the active KRE. K is a batch file which needs to be invoked in the folder of the app allowing me to run vNext commands. project.json needs to be available in order for ‘k’ to know what to do. K is relevant to the active KRE. I see vNext as a major leap and I think MS is on the right path although there’s still a long way to go. I recommend going through the videos specified in the beginning of this blog post, especially the two videos with Scott Hanselman. In my next post I will plan to discuss vNext and Class Libraries.